Updating Eleanor’s room has made me think I should do a little something to our own bedroom too. The shell of the room is good — charcoal gray walls, dark bamboo flooring, a gray carpet, and white trim — but adding some new art and switching out the bedding would go a long way. I picked up this quilt and two matching shams in coral. They were on clearance in the store, though the color seems to be gone online. I think the room needs a little graphic punch, but I haven’t decided on a specific pillow yet. Probably one of these. I think the huge botanical print I ordered might look better in the bedroom than the living room. What do you think? I have some other bedding to play around with already, so I’m not sure if I’ll be keeping the gray and white striped sheets on the bed, or switching them out. We had an old paisley sheet that I loved, but I had it on the bed recently and it finally wore out with a big riiiiiiiiip! I love where this is going! You’ve made me a believer in a good gray wall. I’ll be using that in my next home. Hi. I love the colours you’ve chosen. Just fyi the “our own bedroom” link in your post seems to be broken. We are repainting our living room this summer. I want to use grey. The room is north facing and only has one window. I’m afraid it will be too dark. Your thoughts? I’m not even allowed to put any cushions on the bed! Never mind what colour they are. Hubby thinks they’re too annoying to take off every night. But they’re soooo pretty! I think I’ll compromise and put a heap on the guest bed. The colors you chose are so perfect! The rosy color and the texture mixes in so well with the rest of the room. Subtle changes but huge impact! Great post :) can’t wait to see updated photos! I have the West Elm Channel stitch quilt in gray and have used it for several years now. I really like it! I was contemplating buying the coral one too, but I’m not near a store and no more online…boo! Where did you find your closet doors? Is there a bottom track or just a top track? If there is a bottom, is it stuck into carpet or hardwood? I’m considering replacing the traditional swing-out closet doors in our kids’ rooms (they take up so much room!) and yours are very sleek. Trying to figure out well sliders would work with carpet. I would really love more information about your closet doors as well! I’m needing new bedding too and I’m a cheapskate. A bedding feature would be awesome. I’m awful at putting together cute sets. The botanical would look great in the bedroom on the dark walls, the florals would really jump out. 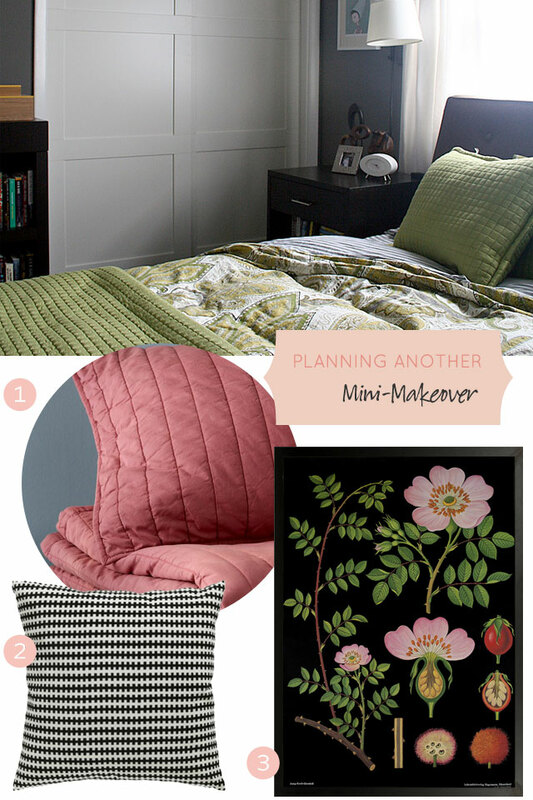 I love the design plan for your bedroom makeover. I do have one question…where did you find your striped sheets? I’ve been looking for grey and white stripe sheets for the longest. Have you seen this botanical print bedding set? Hubby says it’s too florally for him. Love your picks! So much so that I found myself swinging by West Elm this weekend to check out that bedding set. This post actually got me thinking about how often people generally change their bedroom decor. I felt like you had just updated your bedroom, though I see from the post it was 2 years ago — feels like yesterday! I’m going on the 4th year of my current bedroom look, and I guess I love it so much I don’t really think about changing it up. I also don’t switch out my bedding seasonally, and I have noticed other bloggers talking about their summer bedding. Not sure where I’m going with this, but I find it all very interesting. Also…clearly I need more disposable income to devote towards my bed linens! I walked away from the bedding at West Elm today, but I was really tempted. Love the colors – it will work beautifully. Every time you share with us a pic from your bedroom I’m coveting that white oval clock on the nightstand. Can you share where you got that clock? It’s awesome! It was a little cheapie from IKEA! Like $3, I think. Had it for years. I was just on the west elm website and they seem to say that the colour chili is the coral colour that you have. Can I ask where is your bed from?